On October 7th, Thomas was introduced to cloth diapers. Its been a great adventure, zero waste diapers. Even the liners and wipes are reusable. From that date to this date we saved approximately 570 diapers from landfill. 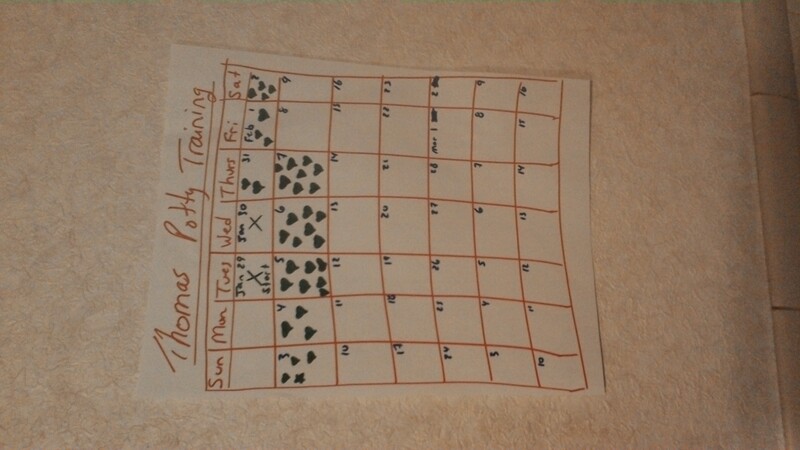 (114 days x 5 diapers per day). Give or take the number. So today I decided to pull out the underwear for Thomas’s size from the attic. After a wash and dry, we will be starting. Day 1 January 29th. Chris has been trying to encourage me to make the the switch with Thomas for a little while. He is right. Thomas is ready and he is super smart. He is talking so much more and asks for things. Tells us, most if the time if he has a dirty diaper. Also, he has gotten some sores, which is not healing very fast. First irritation since we started cloth diapering. I figure as well, being out of the diaper environment, he will heal much faster. This was the final push to start potty training. Thomas is doing really good!!! His sore and rash are gone, probably from an amnonia buildup in the diapers (Racheal, in the comments below, stated it may have been the problem. I believe she is correct). Since then, they have been stripped and Thomas is feeling quite well! 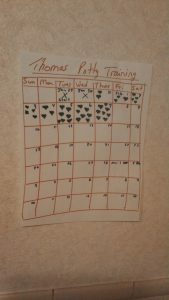 Here is a picture of his chart to show progress. Hi Rachel! I realize this post was from a few days ago but I wonder if the cloth diapers have ammonia build up in them and that’s what is causing his rashes? You mentioned in another post they sometimes have a “barnyard smell” and ammonia build up is what causes the smell. It’s happened to me before when I wasn’t using the right detergent and I had to strip them to get rid of the buildup. The Fluff Love University website is an excellent resource for help with cloth diapers – and their Facebook group is super helpful too! But I do think there was an issue for sure in the diapers. I did not think about ammonia buildup, but that makes sense. He did end up having a small sore in the beginning, and it would not go away, I think maybe that developed in a slight yeast infection. I assumed, the diapers were affected by that. He seemed to start clearing up after we started potty training and wearing underwear. Diaper for the night only. But after 2 days potty training, his whole bum looked like it was burned! Terrible. Poor fellow.